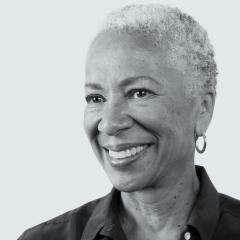 Angela Glover Blackwell, founder and CEO, started PolicyLink in 1999 and continues to drive its mission of advancing economic and social equity. Under Angela’s leadership, PolicyLink has become a leading voice in the movement to use public policy to improve access and opportunity for all low-income people and communities of color, particularly in the areas of health, housing, transportation, education and infrastructure. Prior to founding PolicyLink, Angela served as Senior Vice President at the Rockefeller Foundation. A lawyer by training, she gained national recognition as founder of the Oakland (CA) Urban Strategies Council. From 1977 to 1987, Angela was a partner at Public Advocates.